For more information about this event, please contact Write The Future Company Limited at lambertfraysse@gmail.com. 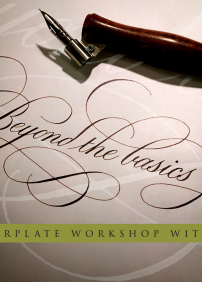 If you have already learnt all the basics and are able to write beautiful Copperplate alphabet, and is hungering for the next improvement, this workshop is tailored for you. In this "Beyond the basics" workshop, we will study swash capitals, flourishing, ligatures, composition, and some typography knowledge. Requirement: This is not a workshop for beginners. You need to be able to write the complete alphabet of Copperplate script with a pointed nib dip pen.